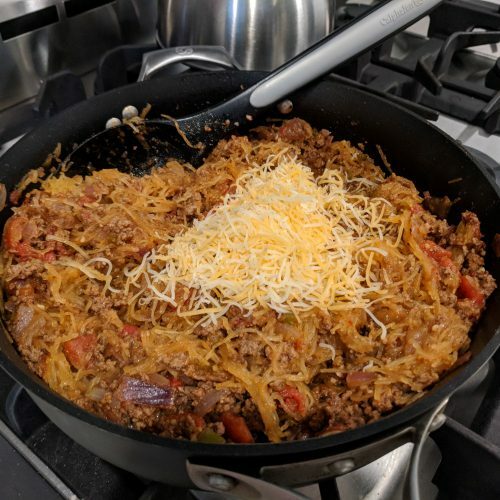 This cheesy, meaty, taco spaghetti skillet will immediately bring you back to your childhood. Hamburger helper, anyone? This recipe yields approximately 4 servings (depending on who is eating it!) and has 475 calories, 18g carbs (all from veggies! ), 28g fat (organic ground beef) and 35g protein! This recipe is gluten-free! If you would rather have pasta, use GF pasta. Barilla makes an entire line to choose from! You can find it in your local market or by clicking here! I LOVE spicy food but I know a lot of people can’t take the heat. If you want to tone down the spice there are a few ways to do so. You can use regular diced tomatoes instead of fire roasted. 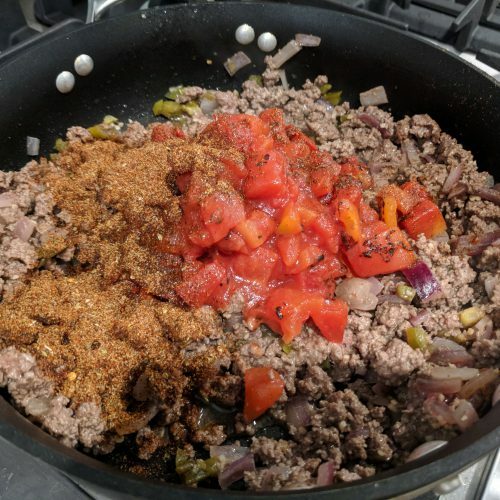 You can remove the jalapenos and the cayenne pepper from the taco seasoning mix. There will still be a little kick, but its a baby kick and nothing to fret about. 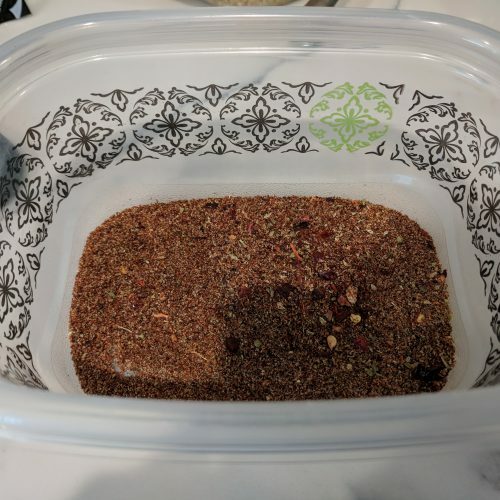 I made my own taco seasoning however if you don’t have time or just plain ol don’t want to, you can use a prepackaged taco seasoning mix. I suggest using half the packet to start. You can always add more, but you can’t take it away!! 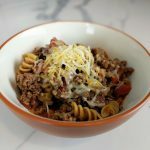 If you use regular pasta you can make this in the instant pot. Simply follow steps 2-5 below however don’t cook the beef all the way through (it will cook more in the Instant Pot). 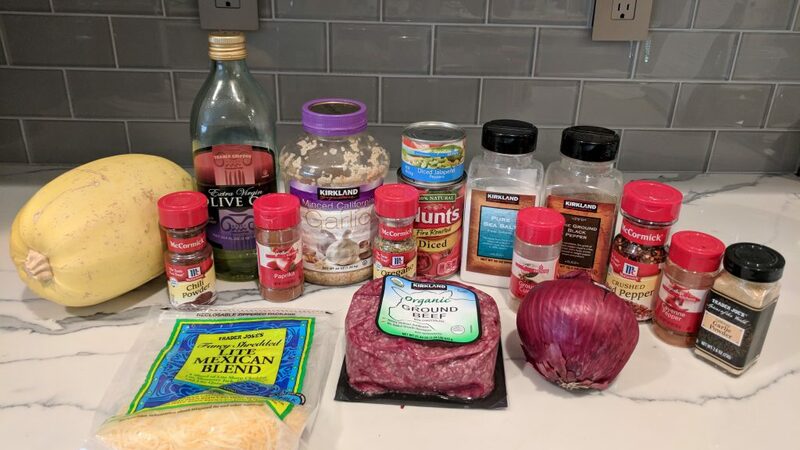 Then transfer ground beef to the Instant Pot. Add jalapeno, taco seasoning mix, tomatoes, 2/3 cup water and 1 cup of dried pasta (I used whole wheat Rotini). Stir. Set IP on high for 5 minutes. Use Quick Release method. Top with cheese and Enjoy! 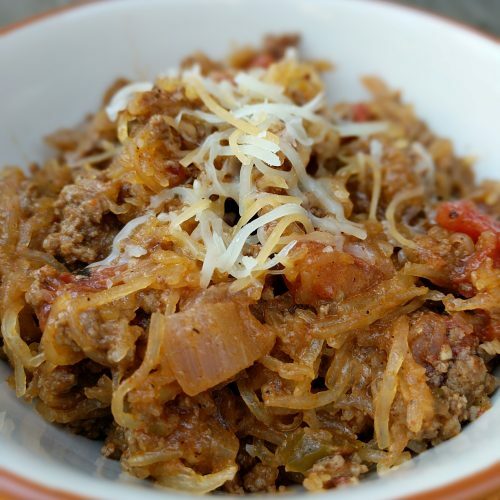 Cheesy, meaty, taco spaghetti squash! in a small bowl, mix together all of the taco seasonings. Stir and set aside. 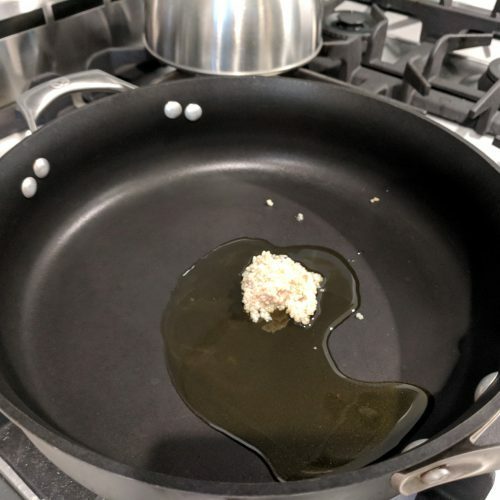 in a skillet, over med-high heat, heat olive oil for about 30 seconds. add garlic for another 30 seconds. 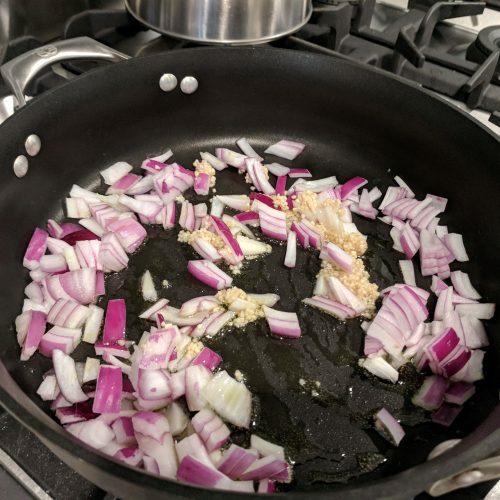 add onions to skillet and saute for approximately 2 minutes until slightly translucent. 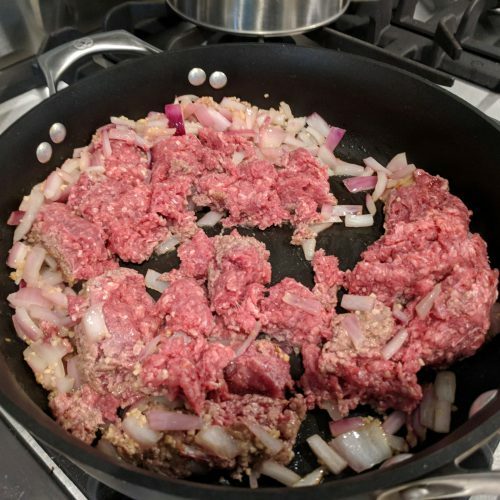 add ground beef to the skillet and cook for approximately 4 minutes. Stirring occassionally. Please note: the meat will still be pink. DRAIN. reduce heat to low-medium. 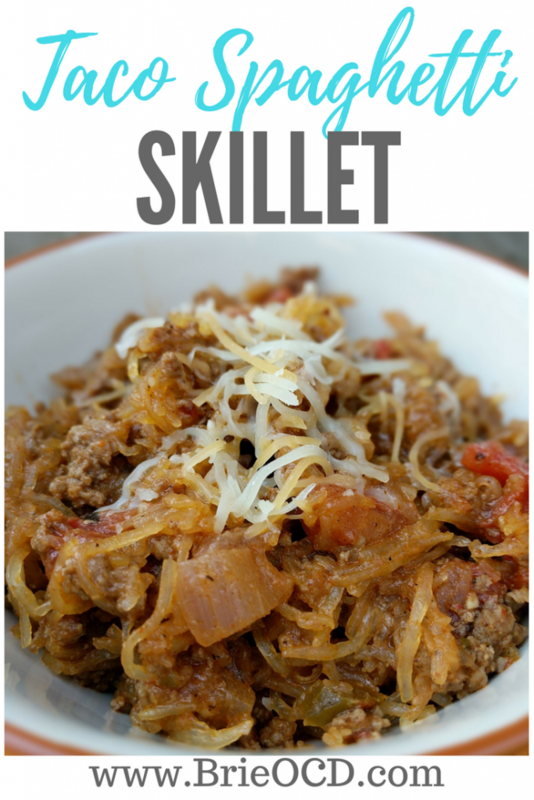 add diced jalapeno, taco seasonings and tomatoes to skillet. Stir and cook for approximately 4 minutes or until flavors meld. 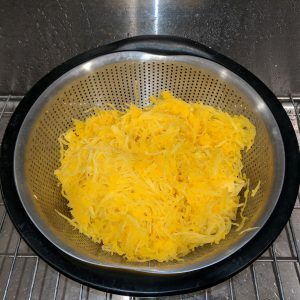 add spaghetti squash and stir. add cheese and stir. serve with additional shredded cheese or Parmesan cheese. Enjoy!